The Lajoie-Start Southern New England Chapter held its annual post-Thanksgiving meeting on Saturday, November 24, 2018, at St. Philip's Parish Center in Greenville, Rhode Island. 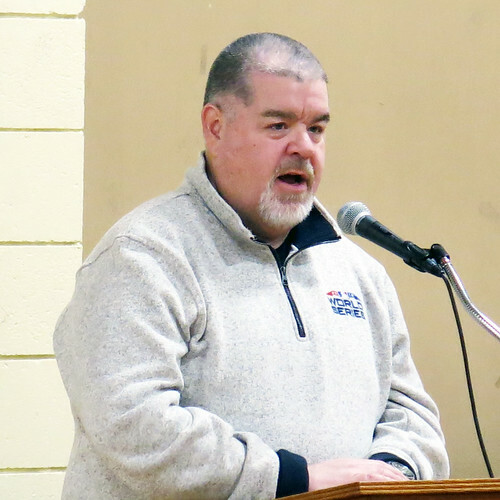 Our guest speaker, Peter Abraham, Red Sox beat writer for the Boston Globe, shared his insights on the 2018 World Series winners. He was lavish in his praise of the Red Sox' manager, Alex Cora, for keeping the team focused on the pennant race all season. David Kaiser presented an analysis of the team according to Wins Above Average. Bill Ryczek offered a biography of Joseph Start, a 19th century player and one of our chapter's namesakes. Greg Rubano gave us an update on the Lajoie Campaign for Youth, named after Hall of Famer Napoleon Lajoie, our chapter's other namesake. Steve Trimble led us through the trivia quiz given to applicants for jobs at the Hall of Fame. Noel Roby discussed his website, The Rhode Island Baseball Experience. Mark Kanter described his recent trip with his wife to Japan during which they saw a number of baseball games. Dixie Tourangeau discussed the career of Herman Long, a star shortstop for the 19th-century Boston Beaneaters. Steve Krevisky gave us an update on the doings of the Connecticut Smoky Joe Wood Chapter and launched the proceedings with an appropriate poem. Father Gerry Beirne's trivia quiz (mostly about the 2018 season) was won by Mark Kanter. Over 40 members cast ballots [ed. : We had 45-plus people at the meeting], and we elected first year eligible Mariano Rivera with 92.8% of the votes (well beyond the 75% required for admission). Nobody else came close to election, with the next highest vote totals belonging to Edgar Martinez and Mike Mussina (42.8%), and Roger Clemens and Roy Halladay (38%). We also took a stab at the "Today's Game Era" ballot. We didn't elect any of the 10 candidates there, with Lee Smith (47.3%) and Orel Hershiser (36.8%) leading the voting. For our June meeting at McCoy Stadium, we plan (at Steve Trimble's suggestion) to hold a mock "unelection" — a vote on what HOF inductees, if any, should be cast out. This may take the form of a ballot or a panel discussion. Our next gathering will take place in June in McCoy Stadium, either June 1 or June 8. Stay tuned for further details. Let me know if you have any suggestions for the program. Click here to view a photo gallery from the meeting, courtesy of Dixie Tourangeau.